Does warm/hot weather affect shipping? We only offer shipping options that require 3 days or less in transit. Our products can ship safely within this amount of time. However, when shipping temperatures exceed 80°F, immediate consumption or refrigeration upon receipt are imperative to mitigate the chance of spoilage. Also make sure that the carrier does not leave your package sitting outside in direct sun. 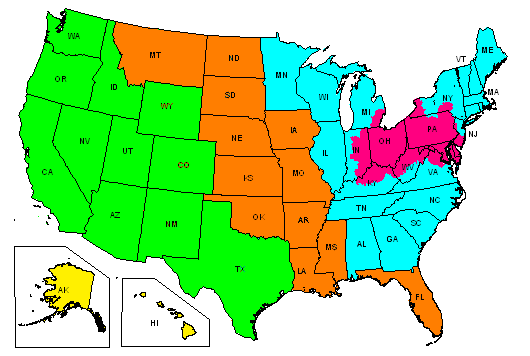 Order by the date shown for each zone and shipping method (zone color map below). Orders typically ship the next business day. Orders placed before 7am (EST), typically ship same day. Packages that risk transit over a weekend (or extended time in warm temperatures) will ship the first business day of the following week. † Includes Saturday delivery. * Carrier guaranteed shipping time. Please use your own best judgment as shipping times vary and these suggestions are typical, but are not guarantees. We offer free and low, flat-rate standard shipping depending on your distance from us. Shipping rates are available for you to see prior to submitting any payment information. Simply add items to your cart and proceed to the Checkout page where you will be offered Shipping Method choices and their prices. We offer only those shipping methods that will deliver the package to your location within 3 days for optimum freshness. We also offer expedited shipping options. Those rates are also available to see after you have added items to your cart. We do not mark up shipping costs for profit, but merely pass along the carrier rates that we are assessed for each package based on delivery speed, weight, and distance. For the sake of freshness we offer only those shipping methods that take 3 days or less in transit. Orders ship the next business day unless the package would be in transit over a weekend, then it will ship the following Monday. If you order by 7am (EST), we can typically process your order for shipping that same day. If you want your order shipped over the weekend and are willing to take that risk, make a note in the order comments during checkout. To estimate your delivery day, count the day a package ships as Day 0 (an Overnight package would be delivered on Day 1), skip holidays or weekend days if your chosen shipping method does not deliver on those days. Please see our Quality Guarantee. Generally speaking, orders ship on the next business day that does not require weekend transit of your package based on your location and shipping method selection. Please see each individual item page for more information on the availability of that item. If you have registered a valid email address with us, in addition to the order confirmation message you get after we receive your order, you will receive a shipment confirmation when your order ships that includes tracking information for the package. You may also track the status of your order through our site.